Asiana Airlines flight OZ162, an Airbus A320-232, from Incheon, South Korea, suffered substantial damage to the left wing, the No.1 engine and the underside of the tail section in a landing accident at Hiroshima Airport, Japan. The flight was cleared for a runway 28 RNAV (GNSS) approach. During the approach a local transient fog layer moved over the airport. The Runway Visual Range in the touchdown zone decreased rapidly as low as 350 m. After that, the value recovered and returned to the value of more than 1,800 m. After the pilot in command and the first officer talked that the appearance of the runway was slightly odd, Hiroshima Tower reported a Touchdown RVR of 1,700 m. After that the captain disengaged the autopilot. At that time the aircraft was flying at 1000 feet above airfield elevation. The aircraft then descended below the normal 3° glide path. At decision altitude, the captain called, "Continue," and continued descending. Immediately after this, the first officer concernedly said, "Runway was not in sight." At this stage, the approach path was getting even lower but still remained uncorrected. The captain said, "Wait a second," as the aircraft descended to a position which indicated four red lights on the PAPI, if visible. The captain instructed the first officer to check radio altitude carefully. Afterward, an Auto Radio Altitude call of "300 ft" and "200 ft" were announced in a short interval, then, the captain called out for executing a go-around, and commenced raising the nose. Accordingly, the pitch angle of the aircraft was just about to increase; however, immediately after that, the aircraft collided with the Localizer antenna array, which is located 325 m before the runway 28 threshold. The aircraft collided with the central parts of the LOC frame stand 6 m high with the both engines, both main landing gears, the flaps, the lower surface of fuselage and the horizontal stabilizers. Having collided with the LOC frame stand, the aircraft badly damaged lights of SALS and touched down on the grass area short of the runway 28 threshold with the fuselage tail, followed by the right and left main wheels followed. The aircraft smashed down ORL lights and proceeded on the runway. The left main gear folded due to severe damage, causing the left engine cowling to touch the runway surface. Subsequently, the airplane gradually veered off the runway to the left finally coming to a stop facing the southeast at the position in front of the airport boundary fence. When the purser came into the cockpit, she was told to wait and the captain gave priority to performing the Emergency Evacuation Checklist. Back in the cabin she heard flight attendants in the rear of the cabin calling and it seemed that smoke was coming up in the rear. She decided that an emergency evacuation was required, and proceeded to the forward left hand (L1) door. Having confirmed the inflation of the evacuation slide, she instructed the passengers to evacuate. The flight attendants then also began evacuating the passengers. All persons onboard were evacuated using the emergency slides and 27 persons suffered minor injuries. It is certain that when landing on runway 28 at Hiroshima airport, the aircraft undershot and the PIC commenced executing a go-around; however, it collided with the Aeronautical Radio Navigation Aids located in front of runway 28 threshold, just before turning to climb. Regarding the fact that the aircraft undershot, it is probable that there might be following aspects in causes: The PIC continued approaching without executing a goaround while the position of the aircraft could not be identified by visual references which should have been in view and identified continuously at or below the approach height threshold (Decision Altitude: DA); and as well, the first officer, as pilot-monitoring who should have monitored meteorological conditions and flight operations, did not make a call-out of go-around immediately when he could not see the runway at DA. Wind, variable 2 knots: Visivility 4000 m: RVR, runway 28, variable between 300m and 1800m, downward: light shower of rain, partial fog: Cloud layers, 1 okta 0ft, 4 oktas 500ft, 6 oktas 1200ft: Temperature, 9 degree-Celsius: Dew-point, 8 degree-Celsius: QNH, 1006 hPa/2973 INS: Remark, Visibility 1500m for east quadrant, fog located from east to south. 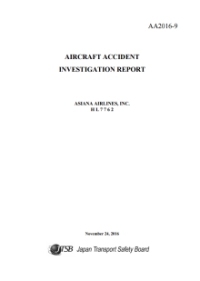 The Company should reemphasize and reinforce the significance of compliance by flight crew members, while reviewing company procedures and ensuring comprehensive training. The Company should surely implement the education and training that flight crew members should refer primarily to visual references, using flight instruments as supplementary tools appropriately, when approaching below DA. Distance from Seoul-Incheon International Airport to Hiroshima International Airport as the crow flies is 668 km (418 miles).